The Institute for United Europe (Instytut dla Zjednoczonej Europy) is a NGO whose main objects are both national and European. At national level it aims at initiating and organizing actions for equal opportunities for development especially between regions, social groups, rural and urban youth, and equalizing opportunities for the development of disabled people. On the other hand it supports activities aimed at developing cooperation between groups, organizations and local communities from different European Union countries in order to facilitate the integration and cohesion process. The Institute is based in Warsaw (Poland) but it operates nationwide with particular attention for rural and socially disadvantaged areas. It has been working in several Leonardo da Vinci and Grundtvig projects dealing with topics such as tourism, traditional folk art and people with disabilities. It organizes trainings mainly in the field of foreign languages and traditional handicrafts. In 2012 the Institute has started developing the topic of tourism. The Institute for Regional Development was founded in 2010 to promote the development of European regions, international exchange of know-how and experience and education of key players in various areas. The main aim of the Institute is to bring together institutions from different spheres – public, non-profit, academic and private to provide expertise in the area of Environment and Ecology, Urban development, Tourism, Human Resources, Employment, Education, Health and Social issues. Education – the Institute provides solutions in the field of education ranging from event organisation and management, expert analyses to sophisticated e-learning. Youth – the Institute engages in youth exchange in the framework of the Youth in Action Program. Tourism – the Institute focuses on innovation in tourism, which includes transfer of experience and know-how within the EU, development of innovative products for tourism and education in innovation in tourism. The Organisation was founded in 2005 and serves wine-growers and other qualified wine tourism suppliers in the Pécs wine region since then. When establishing the Organisation we had a double aim: to organise and help small–scale producers and major wine-growers of Pécs wine region in order to highlight values of the city’s wines, the quality of which increases continuously. We are devoted to popularise quality wine consumption, to preserve and to mediate our gastro cultural values. The Podkarpacie Winegrowers Association (Stowarzyszenie Winiarzy Podkarpacia) was founded in 2006 and is currently the leading and most active sectoral association in Poland counting over 150 members. Its main goal is to support the activity of the members and to promote knowledge in the field of wine growing. 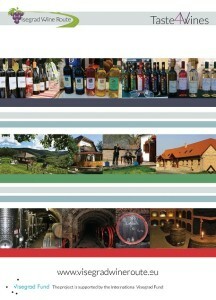 The association organises trainings in winemaking, seminars, study visits, team building meetings. It is also actively involved in the organisation of the largest wine event in Poland – the International Days of Wine in Jasło. The majority of the members of the association is based in the Podkarpacie voivodeship, which is one of the regions with the lowest GDP per capita in Poland. Local authorities are trying to promote tourism in the region and wine tourism has been identified as one of the most promising tourist products. However, there are currently few opportunities for wine makers to receive training in the field of marketing, thus it is paramount for the association to develop the knowledge of its members about marketing of wine tourism. Citizens’ Association MOHYLA (Občianske združenie MOHYLA) is a non-profit organisation, which consists of a group of volunteers, who supports educational activities for youth and adults in cultural and educational programmes in Eastern Slovakia. We support activities aimed at developing cooperation between the groups, organizations and local communities from different European Union countries in order to facilitate the integration process. Our organisation helps people with vocational and processing activities, consultancy with EU projects concerning funds and grants for organisations, companies and regional interest groups. MOHYLA is based in Stropkov in North-East Slovakia. Our region is disadvantaged by its location and high rate of unemployment.